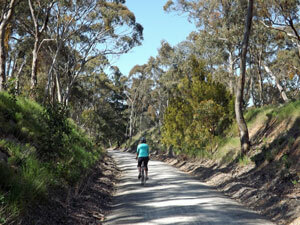 The Riesling Trail is one of a number of rail trails springing up in various parts of the country, where old disused railway lines are "re-cycled" into cycle paths. Rails and sleepers are removed and compacted gravel bedded in to provide a cyclable route with few bends and gentle gradients - great for the family outing. Having never ridden a rail trail before, we took the opportunity of stopping off in the Clare Valley on our way from walking the northern end of the Heysen Trail to continuing our walk at its southern end. 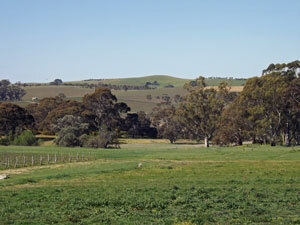 The 33 km long Riesling Trail follows part of the old Adelaide to Spalding railway line, built between 1860 and 1918 and abandoned in 1983 after a fire destroyed long sections of the line. 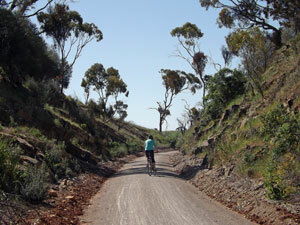 Opened as a cycle path in 1994, it has become one of the better known rail trails in the country, not least because it passes through one of the great wine-growing regions of South Australia. There are over 30 wineries in the Clare Valley and, even on a bicycle , it is possible to visit several and sample their vintages. 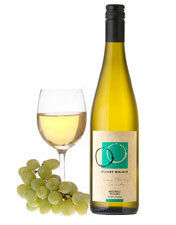 As the name of the trail implies, the region is most famous for its riesling. 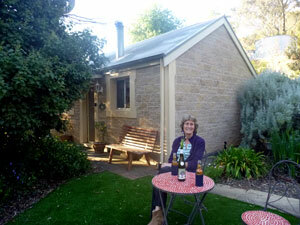 Our accommodation in Clare was a heritage-decorated cottage in a wooded street on the outskirts of the town. 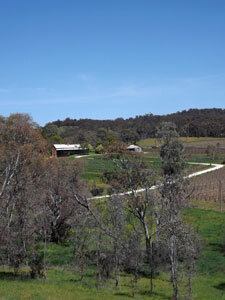 The Riesling Trail virtually passed the front door and a bike hire place lay just across the road. Thus, on a fine sunny morning, we wandered over the road, picked up our rental bikes and set off, pedalling southwards out of Clare and into the surrounding forest and vineyards. With few turns and little gradient, riding was very pleasant, as we passed from embankment to cutting. 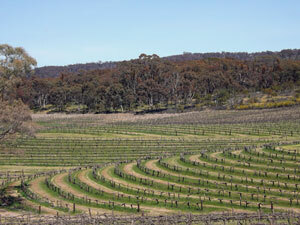 Remnants of native forest showed what the landscape used to be and green pastured paddocks and blocks of trellised grapes, just budding their first green shoots, showed what it had become. Both were attractive in their own way. 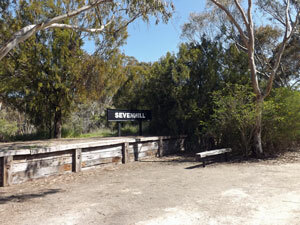 Just after the old platform at Sevenhill, we turned off the rail trail into the village of Penwortham for a morning coffee and slice of traditional "kuchen mit streussel" just like my grandma used to make (such is the zeitgeist of the rail trail). 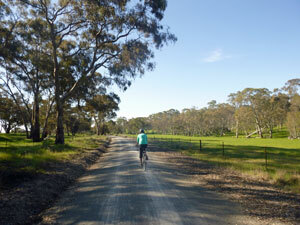 continuing on in this vein, we followed the John Horrock side loop along a quiet country road. It was good to put in the effort of a steep climb and zoom down a steep hill, albeit briefly. 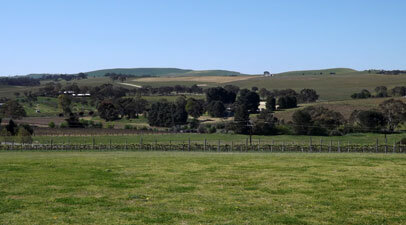 The loop brought us to Skillogalee Wines, a good place to stop and sample the different varietal wines of this vineyard. 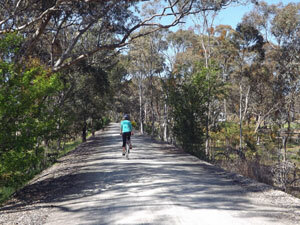 Then it was back on to the rail trail to continue our steady push southwards on a general slight downhill trajectory. The landscape after Penwortham was more open - sheep grazed on lush green pastures and workers tended the long rows of vines to encourage their spring flush of growth. After a long stretch of riding, we reach the village of Auburn with its historic bluestone buildings. We chose one of them - the local pub - for our lunch spot. 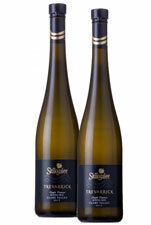 Grilled fish washed down with a local slightly drier riesling seemed the way to go. Auburn is the southern terminus of the rail trail, so after lunch we retraced our path. The day was warming up and we were starting to work up a bit of a sweat. It was time to call in at O'Leary Walker Wines where the restaurant / tasting rooms have expansive views over the low hills and vineyards of Leasingham. A coffee in the cool shade of the verandah and a quick sample of their take on riesling and we were back on the rail trail - settling into a steady cadence, we rode back along the Riesling Trail towards Clare. It was one more chance to take in the pleasant landscape mix of pasture, vines and forest and one more chance for the magpie at Sevenhill to swoop us. All journeys have to have a little bit of adventure. Sitting in the shade outside our cottage at the end of the day, we declared it a day well spent. Riding a rail trail is not going to give you an adrenalin rush or tax your fitness, but, for us, it was a lovely way to take in the landscape, history and culture of the Clare Valley (not to mention the riesling).